Dogs and cats can be hard on their joints. 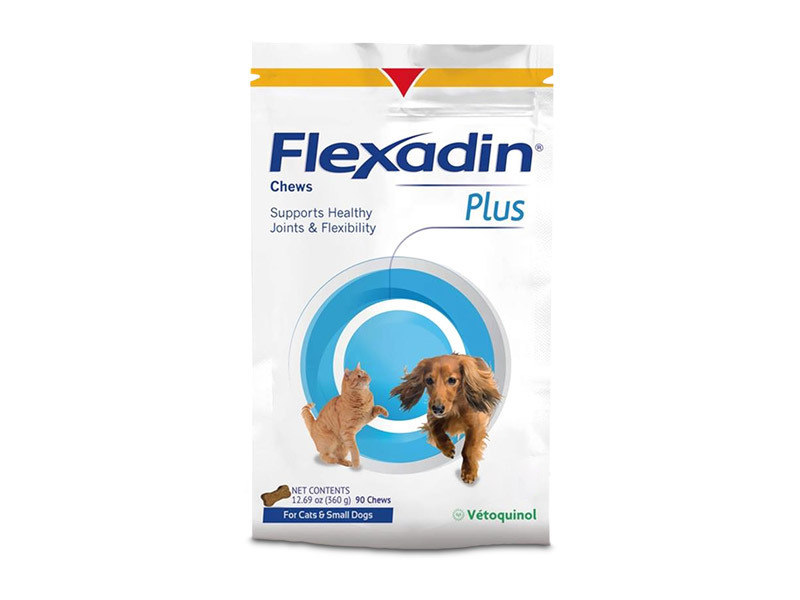 Flexadin Plus is a comprehensive formula that supports their joint health and flexibility. Also view our breakthrough product Flexadin® Advanced with UC-II for dogs and cats. Give Flexadin Plus directly to your pet or place it in its food. Dose can be adapted to the animal's needs as recommended by a veterinarian. For cats and small dogs, per chew: glucosamine HCI, 125 mg; chondroitin sulfate, 100 mg; harpagophytum procumbens (devil's claw), 37.5 mg; omega-3 fatty acids, 37.5 mg; dl-methionine, 18 mg; eicosapentaenoic acid (fish-oil omega-3), 5.4 mg; docosahexaenoic acid (fish-oil omega-3), 3.8 mg; manganese (manganese sulfate), 2.5 mg; and vitamin E, 10 mg (5 IU). For medium and large dogs, per chew: glucosamine HCI, 125 mg; chondroitin sulfate, 100 mg; harpagophytum procumbens (devil's claw), 37.5 mg; omega-3 fatty acids, 37.5 mg; dl-methionine, 18 mg; eicosapentaenoic acid (fish-oil omega-3), 5.4 mg; docosahexaenoic acid (fish-oil omega-3), 3.8 mg; manganese (manganese sulfate), 2.5 mg; and vitamin E, 10 mg (5 IU). Consult your veterinarian before giving your pet Flexadin Plus. Follow the recommended administration on the package, unless otherwise instructed by your veterinarian.